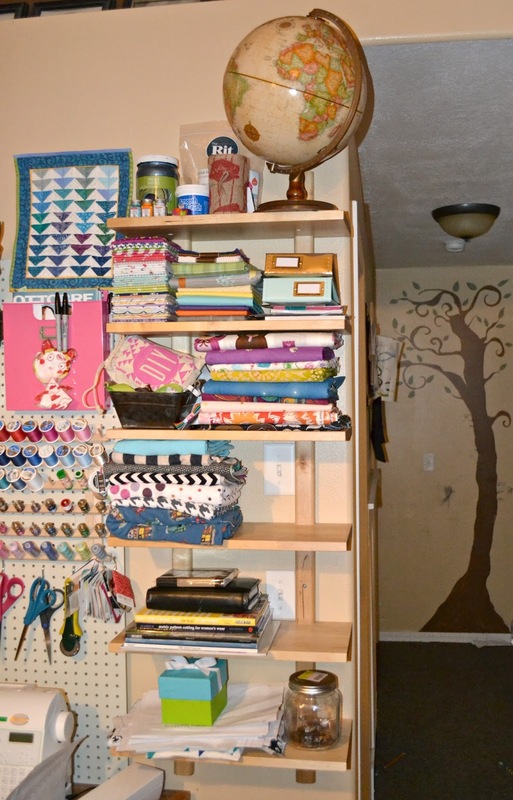 Mostly by choice, but also because I really didn't know where I could set my sewing space up and I really hated having to pull it out and set it up on the table to have to put it all away. You would think that having it on the floor my children would play with it constantly, but no. Only when it was on the table would they play with it. Could be the fact that we have lived in our house for 3 years and our basement still is not finished and I'm tired of waiting (which really is a big reason) but my main reason is that during SNAP, I brought home a Babylock Elizabeth. That baby is too good for the floor. The area that would work the best for me was a 6' by 3' space in our dining room. I removed our family pictures and am moving it to another wall and I put all the books in our hallway closet. I left the desk, cause I kind of needed that. We got the peg board off our towns yard sale page for a really good deal sometime last year and my husband cut one board in half and then put it up on the wall using a Ryobi Power Drill. We also had a shelving unit from IKEA sitting in our garage that I had my husband put up next to it. Then I got to work putting up all of my stuff. I hung up my 60 count spool holder and put my scissors under it. During SNAP I went on the Thrift Shop Tour and found this tin vase, so I used a vinyl pack that I got from SNAP on it and then put dried flowers and stems in it. 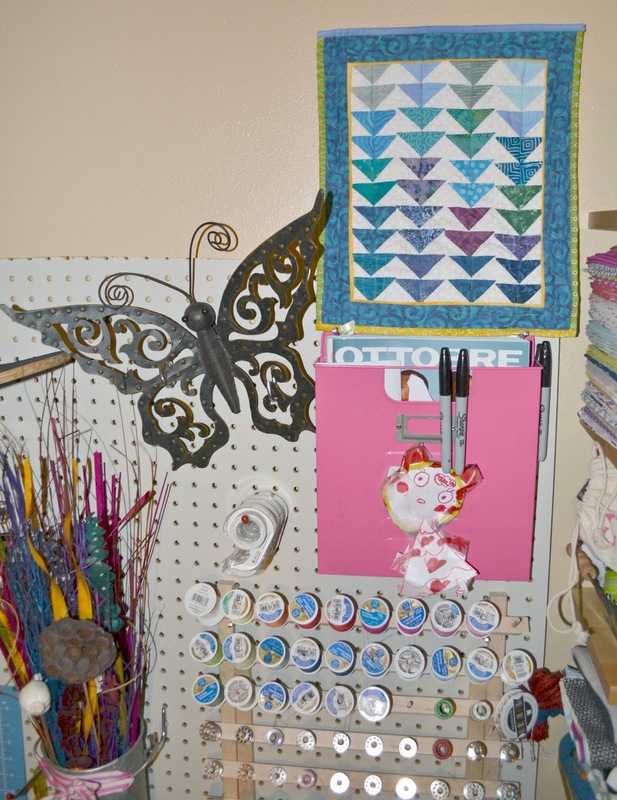 I hung my divider up with a fun craft picture. That saying is so true, by the way. I couldn't find any wood the size I needed for a shelf here, so I used my daughters skateboard instead. Then I have a metal homework folder (with complimentary child artwork) to hold my Ottobre magazines. One of my girls butterflies they kept taking off their walls and an adorable decorative mini quilt that Judi Short made me for a bag exchange during Sewing Summit. Now for my IKEA shelves. My awesome globe, paints and stuff on the top, followed by my PR&P fat quarter wins and picture books. And then we have fabric with a tin of notions followed by more fabric on the next shelf. My magazines, sketch, and pattern books. 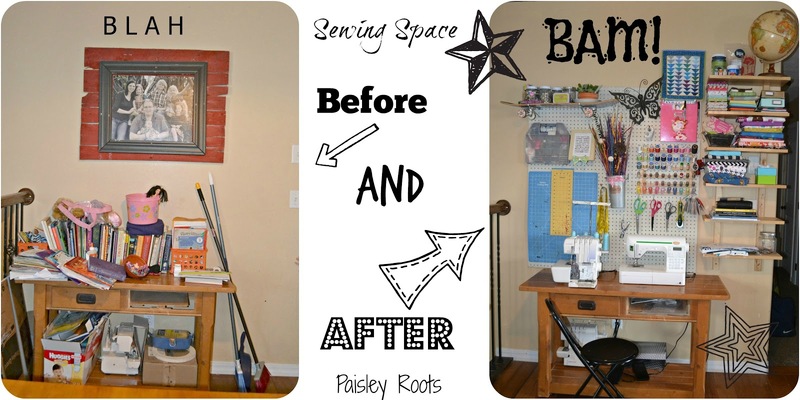 And that is my 6' by 3' sewing space in our dining room! 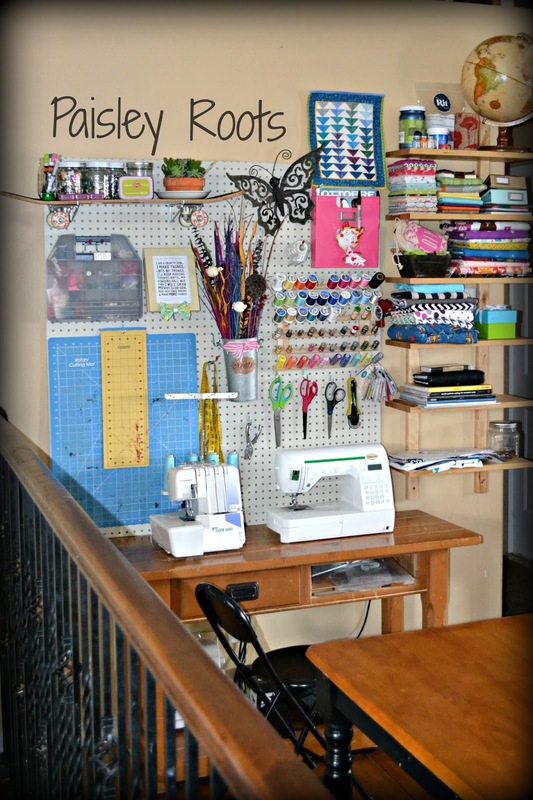 And now that you've seen this awesome sewing space (mind-blowing awesome) it's making you feel inspired to sew and buy more patterns right?? Looks so much better (and more comfortable) than the floor! Congrats on the new space lady! It looks great! 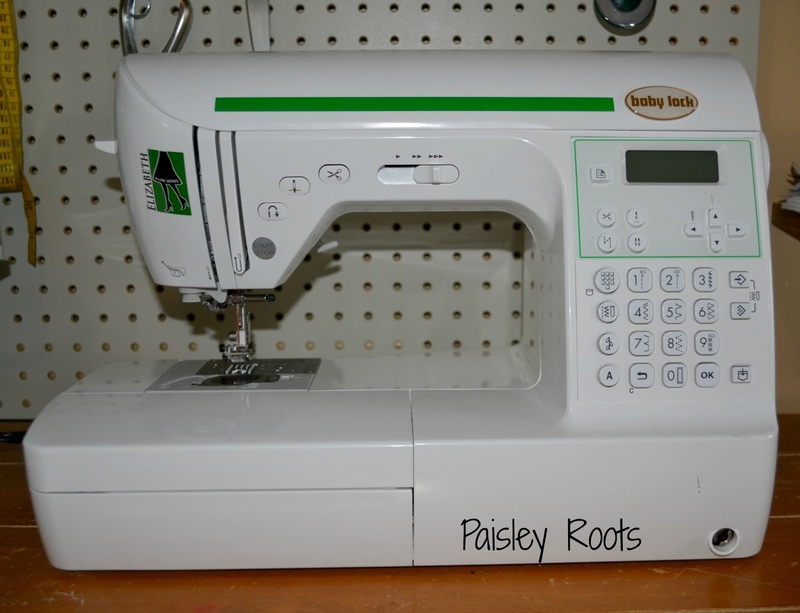 I am swooning over your baby lock machine! That machine definitely needed its own space :) I don't know how you ladies with small spaces do it. My fabric stash wouldn't even fit in that little space haha. 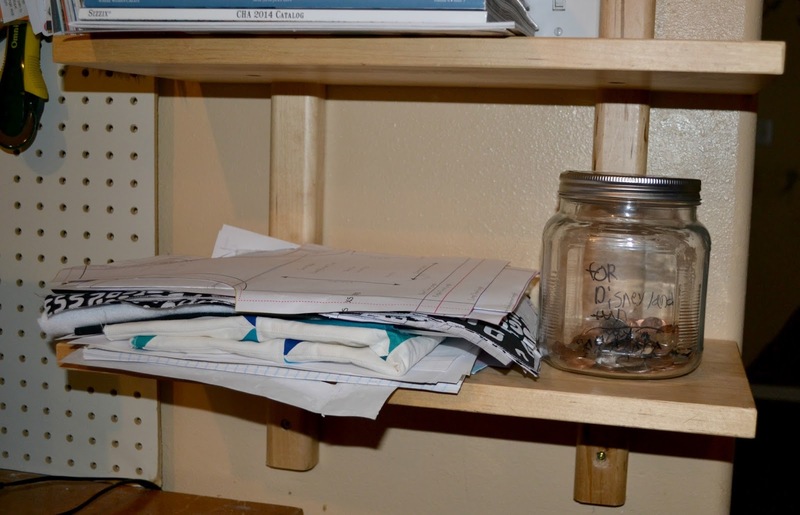 It looks so well organized though. I love the skateboard. It's just perfect. I love everything about this! The skateboard turned into a shelf is genius... and that quote is great! Nice work!